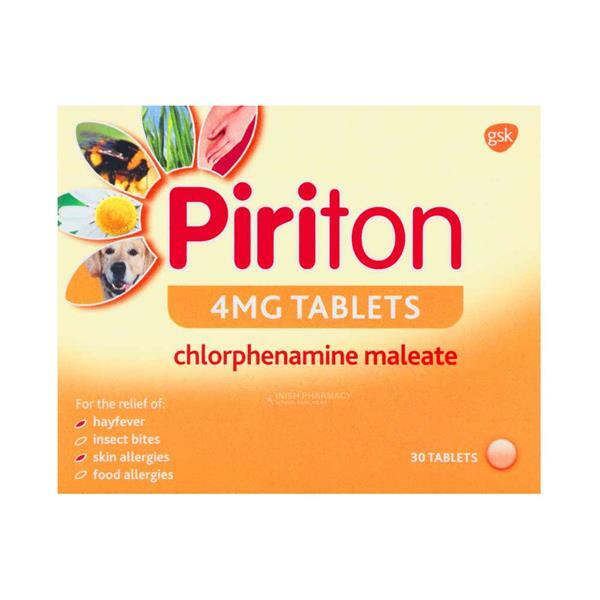 Piriton tablets are used to treat the allergic symptoms of hay fever and other allergies such as dust mites and rashes associated with hives and nettles. Piriton can help relieve the symptoms of these allergies including itchiness, redness, swelling, tenderness and irritation. Each tablet contains Chlorphenamine Meleate 4 mg. Adults and children over 12 years of age: take 1 tablet every 4-6 hours (maximum 3 tablets in 24 hours). Children 6-12 years, take half a tablet every 4-6 hours (maximum 6 half tablets in 24 hours). The minimum dosage interval is 4 hours. Each tablet contains Chlorphenamine Maleate 4 mg.
Other Ingredients: Lactose monohydrate, maize starch, pre-gelatinied maize starch, magnesium stearate and the colouring agent yellow iron oxide (E172). Piriton tablets are suitable for adults and children over the age of 6 years. How to take Piriton Tablets? Piriton should not be used during pregnancy or breastfeeding. Piriton may cause dizziness, drowsiness or blurred vision. You should not drive or operate machinery until you are sure you are not affected. It is recommended to avoid taking alcohol at the same time as this medication. Fatigue, dry mouth, nausea, dizziness, headache, blurred vision and disturbance in concentrating.